Snow will hit the Watertown area Tuesday afternoon and could make for a messy evening commute. The National Weather Service has issued a Winter Storm Watch from 2 p.m. Tuesday to 1 a.m. Wednesday. The precipitation will begin as snow and turn to sleet and then freezing rain. 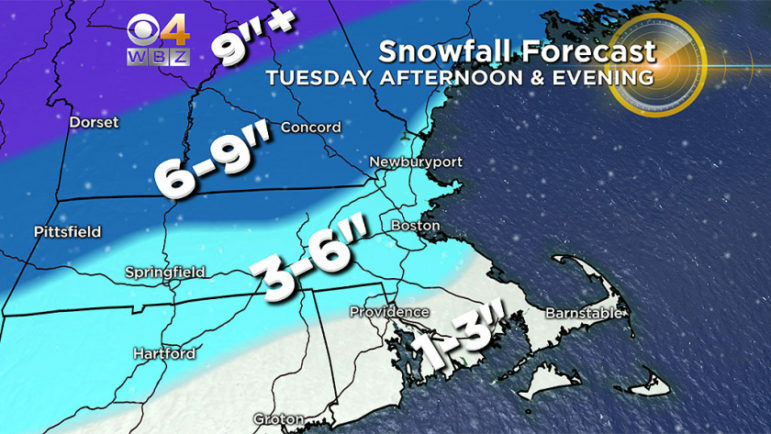 Forecasters at WBZ Channel 4 say that the area could get 3 to 6 inches of snow during the storm. Ice is possible Tuesday night, especially north and west of Rte. 128. Precipitation will continue Tuesday night into Wednesday morning but will transition to rain by then, according to WBZ.